Recently I had the opportunity to visit one of Habitat for Humanity's new neighborhoods just east of town. This community of 49 homes is about half finished, and it was a flurry of activity the morning I visited. 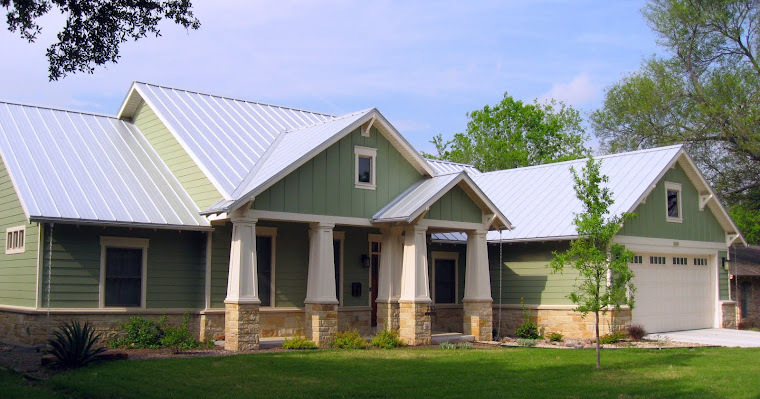 Habitat, which has built over 300 homes in the Austin area, has been using green construction techniques and materials for several years, dispelling the myth that green building is cost-prohibitive for regular folks. In fact, most of Habitat's homes earn the maximum rating of five stars from both the Austin Energy Green Building program and Energy Star! This approach makes a lot of sense -- when you're building for low-income homeowners, a small investment up front can really help to improve the affordability of the homes in the long term. That's why all of Habitat's homes include features like high-efficiency HVAC and water heating, Energy Star appliances, low-E windows, quality insulation, low-flow plumbing fixtures, durable flooring, and waterwise landscaping. And the houses are cute, too. My friend Lee (who showed me around) designed most of them and took great care to ensure that each model has its own personality. While it was in the works, a donor came forward and offered to pay to put solar panels on one house. Because of the cost of solar panels -- and because Habitat, as a non-profit, doesn't qualify for the usual solar incentives -- Lee suggested instead using a similar amount of money for a variety of other energy-efficiency and "healthy home" upgrades. As a result, this home has such features as an extra-high-efficiency water heater and HVAC system, no-VOC paint, a 500-gallon rainwater cistern, solid surface counters, and Energy Star light fixtures, and LED bulbs. Austin Habitat for Humanity is setting a great example for Austin builders by proving that anyone -- anyone -- can build a five-star green house.